You know the rudiments of the SQL query language, yet you feel you aren't taking full advantage of SQL's expressive power. You'd like to learn how to do more work with SQL inside the database before pushing data across the network to your applications. You'd like to take your SQL skills to the next level.Let's face it, SQL is a deceptively simple language to learn, and many database developers never go far beyond the simple statement: SELECTFROMWHERE. But there is so much more you can do with the language. In the SQL Cookbook, experienced SQL developer Anthony Molinaro shares his favorite SQL techniques and features. You'll learn about: Window functions, arguably the most significant enhancement to SQL in the past decade. If you're not using these, you're missing out Powerful, database-specific features such as SQL Server's PIVOT and UNPIVOT operators, Oracle's MODEL clause, and PostgreSQL's very useful GENERATE_SERIES function Pivoting rows into columns, reverse-pivoting columns into rows, using pivoting to facilitate inter-row calculations, and double-pivoting a result set Bucketization, and why you should never use that term in Brooklyn. How to create histograms, summarize data into buckets, perform aggregations over a moving range of values, generate running-totals and subtotals, and other advanced, data warehousing techniques The technique of walking a string, which allows you to use SQL to parse through the characters, words, or delimited elements of a stringWritten in O'Reilly's popular Problem/Solution/Discussion style, the SQL Cookbook is sure to please. Anthony's credo is: "When it comes down to it, we all go to work, we all have bills to pay, and we all want to go home at a reasonable time and enjoy what's still available of our days." 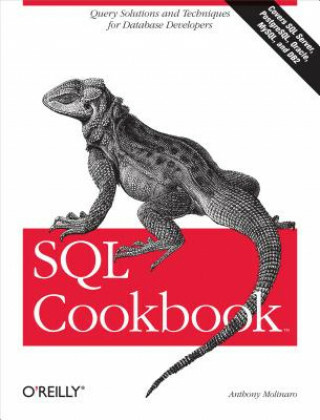 The SQL Cookbook moves quickly from problem to solution, saving you time each step of the way.